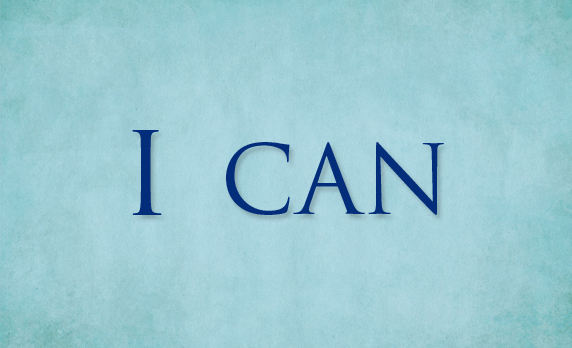 Impact Questions (IQ): How do we develop an “I can” mentality? Josh Billings wrote “Consider the postage stamp: its usefulness consists in the ability to stick to one thing till it gets there.” There are some things that come natural to us, but there are aspects that can be reached with perseverance that starts with the phrase I can. We get a lot more accomplished with thinking on the things that God enables us to do than on focusing on our difficiences. I can promises potential action. I can’t promises an abundance of absolutely nothing. When faced with what God said you cannot or should not do, rest in the freedom of walking in what God allows. Within His will awaits endless opportunity to enjoy life-giving options without the fear of regret and shame. The All of God promises all of who you were meant to be instead of the struggle to become something that you’re not. Just stick to the promises that God gave you until it gets there. Philippians 4:11-13 I am not saying this because I am in need, for I have learned to be content whatever the circumstances. I know what it is to be in need, and I know what it is to have plenty. I have learned the secret of being content in any and every situation, whether well fed or hungry, whether living in plenty or in want. I can do all this through him who gives me strength. 1. Write down what gifts and abilities that you are able to do and, when your feeling negative about yourself, read these things aloud. 2. War against the tendency to compare yourself with others. God blesses all His children uniquely. 3. Welcome the abundance of a life lived in Jesus without the side-effects that come with decisions made without Him.